GitHub - TsubokuLab/ofxBezierWarpManager: Manager for multiple ofxBezierWarp. 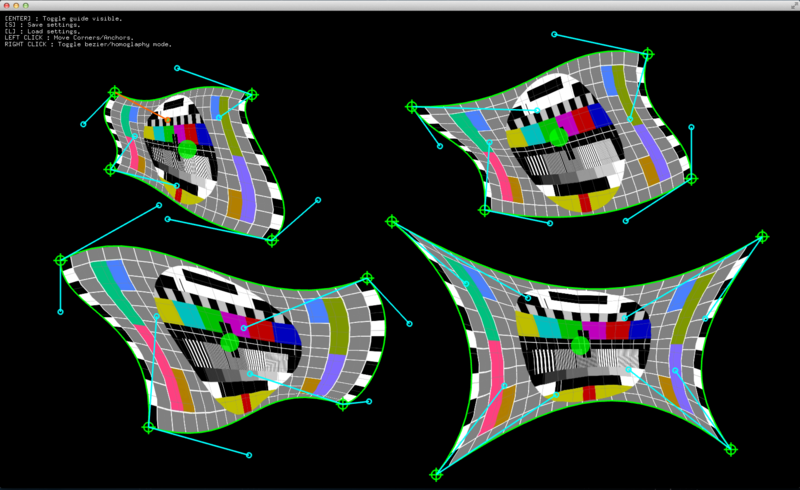 openFrameworks_v0.8.4 with OSX / Windows tested. Manager for multiple ofxBezierWarp. openFrameworks_v0.8.4 with OSX / Windows tested. Want to be notified of new releases in TsubokuLab/ofxBezierWarpManager? This addon is manager for multiple ofxBezierWarp. [ENTER] key : Toggle guide visible. [S] key : Save settings. [L] key : Load settings. Left drag the control point : Move Corners/Anchors. Right click the control point : Toggle Bezier/Homoglaphy mode. 1. Import to your project. 2. Setup and add FBO. 3. Draw to FBO between "begin()" and "end()"